Collie Dogs - The Collie is a medium sized dog breed in the herding group. The highlands of Scotland were the natural home of the collie, where the sheepdogs had been used for centuries by shepherds, but the modern form of the breed was mostly developed in England in the late 1800s. Collies come in two varieties of the breed based on coat length in America; in the UK these are shown as separate breeds. 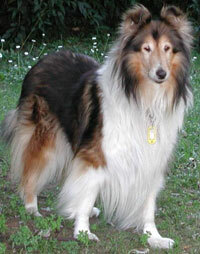 The rough collie is the collie seen in films and on television (e.g., Lassie). The downy undercoat is covered by a long, dense, coarse outer coat with a notable ruff around the neck, feathers about the legs, a petticoat on the abdomen, and a frill on the hindquarters. The smooth collie likewise has a double coat, but the outer one is short and dense, albeit there is a notable ruff around the neck. Both rough and smooth varieties are available in four distinct colors. Sable collies are generally the most recognizable, the choice of the Lassie television and movie producers. The sable color on these dogs can range from a light blonde color to a deep reddish-brown, with any hue in between possible. Tri-colour dogs are mostly black and white with tan markings. Blue Merle collies are best described as tri-colour dogs whose black has been diluted to a mottled gray-blue color. White collies are usually mostly white on the body with a head coloration of any of the three previous. A lesser-known variant of blue merle colouring is that of the "phantom merle" - a seemingly tri-colour dog, with only perhaps a slight merling of one or two areas of fur, which actually carries the gene for merling, which is a dominant dilution gene. If bred to another dog with a merle gene, the resulting pups may be "double-dilute", which can result in devastating and lethal neurological conditions. Collies are known to be generally sweet and protective. They are generally easy to train due to a high level of intelligence and a willingness to please. Some collies are a bit clingy, but this is often seen as an overdeveloped sense of loyalty. They are excellent herding dogs and benefit from the companionship of a family or other dogs. This information is licensed under the GNU Free Documentation License. It uses material from the Collie article on Wikipedia.org. Collie Breeders - Advertise your kennel puppies and dogs here.